How to Choose a Sterilizer - Which Sterilizer is Right for You? How to Choose a Sterilizer – Which Sterilizer is Right for You? Sterilization is useful in many situations, sometimes unexpectedly. During the 2001 anthrax scare our company, and many others in the industry, stepped in to help the government sterilize the federal mail (http://www.nytimes.com/). This business is all about keeping people safe and healthy. That’s why it’s important to know how to choose a sterilizer that meets industry requirements. If you reuse the same equipment or instruments, you know that you need a sterilizer to kill bacteria and create a sterile environment. Choosing the right sterilizer can seem challenging when you consider that dentists, orthodontists, medical doctors, veterinarians, lab technicians, tattoo artists, body piercers, nail salons, and spas all have different sterilization needs. In the last two articles, we told you how to verify that your sterilizer works and how to choose the right sterilizer for the job. In this article, we will show you how to choose a sterilizer that will work for you. Sterilization procedures in a laboratory environment depend on the type of lab you’re working in. Most laboratories use large (20-inch) steam sterilizers. Usually laboratories do not have to meet FDA requirements, so you can choose less expensive equipment. To save the most money, choose a sterilizer that meets, but does not exceed your needs. Dentists must use FDA approved sterilizers that meet certain standards. All reusable equipment must be sterilized between patients. Dentists typically use 10-inch table top sterilizers that fit 3 to 4 trays of instruments. Orthodontists have slightly different requirements. Since they see more patients per day and require very sharp instruments, they typically use dry heat sterilizers or rapid steam sterilizers. 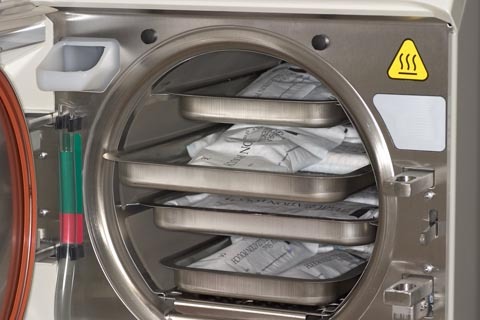 Dry heat sterilizers are preferred because they extend the life of the equipment. Most physicians use disposable equipment. However, some specialists, like gynecologists and ophthalmologists, use very expensive equipment that must be reused. They typically have the same requirements as orthodontists, with dry heat sterilization being the preferred method, since they may need to sterilize the same equipment 3 to 4 times per hour. Veterinarians do not have to meet FDA requirements for sterilization, but most follow good practices to avoid contamination between animals. We believe that more veterinarians should test their sterilizers to make sure they work. Contact our staff, who can help you choose the right sterilizer for your practice. We hope this information has helped you understand how to choose a sterilizer that’s right for you. To sum it up, consider the following factors when choosing a sterilizer. Legal Requirements – Do you need FDA approved equipment? Method of Sterilization – Steam or dry heat? Size – Do you have enough room? Speed – How long between uses? As always, the team at sterilizers.com is ready to assist you via phone or email. We can help you choose a sterilizer that will suit your needs and give you the most bang for the buck. We have 30 years of experience in the sterilization industry and are one of the leading sterilization manufacturers in the country. If you’d like assistance, don’t hesitate to call us today at 1-877-789-9983.